Heat up the rum with 2 tbsp. sugar and about 3 tbsp. water, add the raisins and leave them to soften overnight. Slice the apples, remove the seeds. Cut the apples in halves and cut or slice as thinly as possible. Roast the almonds in a pan till golden brown. Add flour, liquid butter, milk, eggs, remaining sugar and 1 pinch of salt in a high cup and blend with a blender till the dough is smooth. 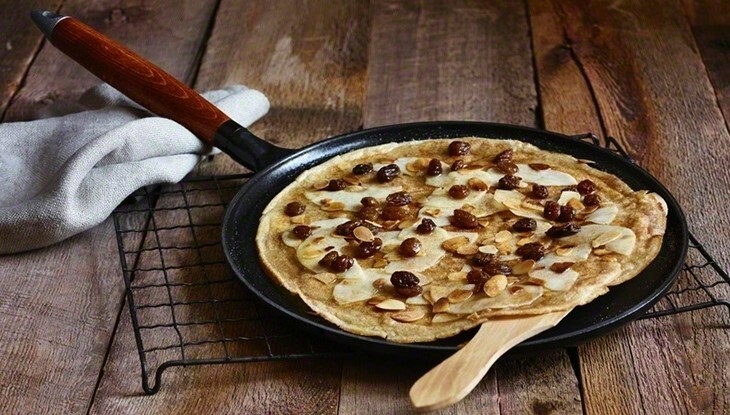 Remove the pan from the heat, cover the baked crêpe with the thin apple slices. Arrange roasted almonds and raisins with the rum marinade on top and generously sprinkle with cinnamon sugar. Follow the same steps to prepare the other 3 crêpes.